Our mission in the Office of Student Life is to contribute to your holistic education by providing programs, services and facilities that advance learning, development, and discovery of self, provide an out-of-class environment that promotes satisfaction with the collegiate experience and contributes to recruitment, retention and institutional affiliation. We foster an environment that prepares you to become a life-long learner, leader, responsible citizen, and productive member of a diverse and global society, empowering you to maximize your potential and attain personal fulfillment. To distinguish Student Life as a significant contributor to the co-curricular educational experience of the student population. 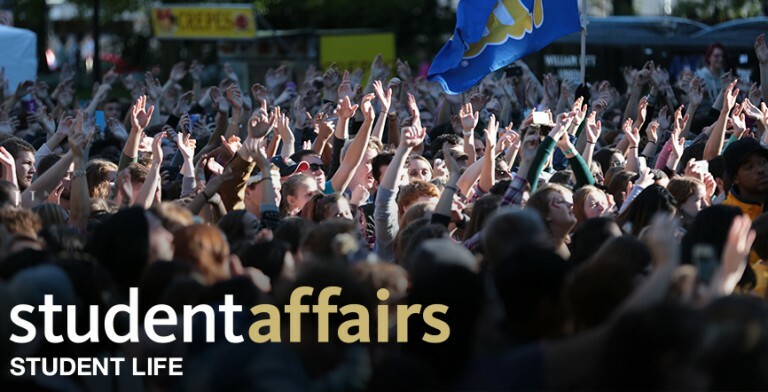 All students are entitled to a full measure of the benefits of Student Life at the University. Academic learning is enhanced by experiential education. Collaboration with faculty and academic units enhances the learning experiences outside of the classroom. The promotion of understanding, appreciation, and acceptance of diversity is essential to a holistic education. Students have a right to exercise representative self-governance. Student organizations are an essential part of campus life and are a primary source for leadership development, learning, personal development, and programming. Co-curricular service-learning and community service activities are essential components of a co-curricular program for students. The design and delivery of Student Life programs are enhanced by partnerships with student organizations. Providing organization-specific and general leadership training and experiential opportunities is an essential component of Student life. Professionally accepted best practices in customer service relevant to the program or service must be utilized in their delivery. Fraternity and Sorority Life aid in the personal and educational development of student members, benefit the campus and community, and enhance the institutional affiliation of members and alumni. The quality and quantity of student involvement impacts student learning and development. To facilitate the learning and development of students, staff must engage in continuous learning and development opportunities. Teamwork and collaboration create a synergy that enhances the quality of programs and services and the outcomes achieved by students. The assessment of outcomes achieved by students with whom we deliver Student Life programs and the students for whom the programs are intended is essential to the success of the programs.